I left off last time in the middle of a Slovenian cream cake, which is a good place to take a break. Bled has so many amazing things to do and somehow Mo and I managed to cram it all into one day. Looking back I’m not quite sure how we managed to do it, but truthfully we didn’t feel rushed. I guess it helps that everything in Bled is very close together. I think if we had decided to stay a bit longer we could have lounged around a little, but since it was the beginning of my trip I wasn’t really ready for lounging– I was ready to roll. After our cream cake siesta we headed for the bus stop for the short trip to Vintgar Gorge. It was a very short trip. Vintgar Gorge is located just outside the town of Vintgar, along the bus route that leads to the town of Podhom. The ride from Bled is maybe ten minutes and, if we hadn’t been stuffed with cake and tired from swimming to a church, we probably would have walked. The bus dropped us off at the edge of town and one of the loveliest parts of the trip was walking through the town Vintgar. Cute is the only word for it. 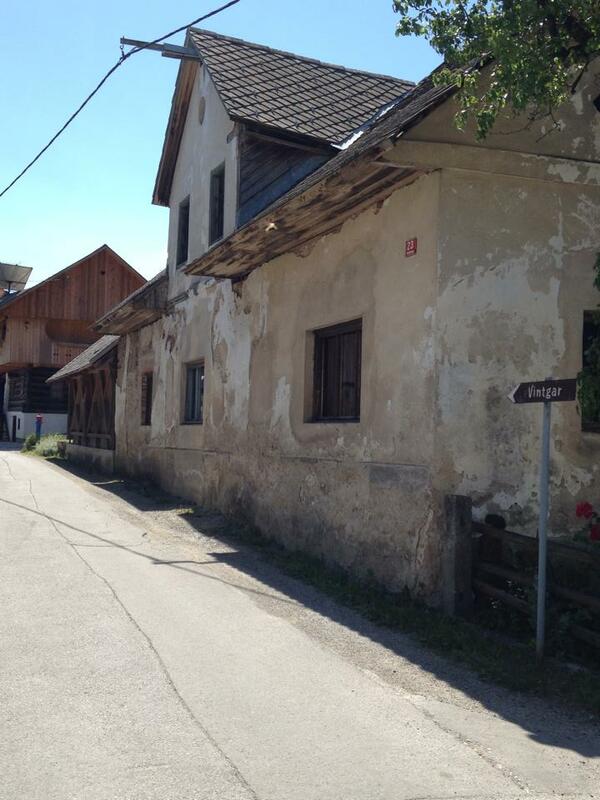 The houses are all very traditionally Slovenian with wooden siding and window boxes of geraniums. Carefully tended vegetable gardens highlight every front yard and playing children look up from playing. Of all the places I’ve been so far, the town of Vingar (and Bled) probably top my list of places to raise a family. The Slovenian countryside is a kid’s paradise. 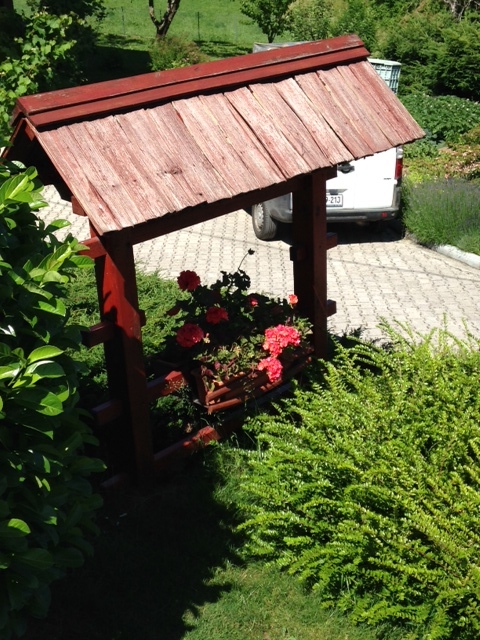 Geraniums seem to be Slovenia’s national flower. After a ten minute walk we reached the start of the gorge. 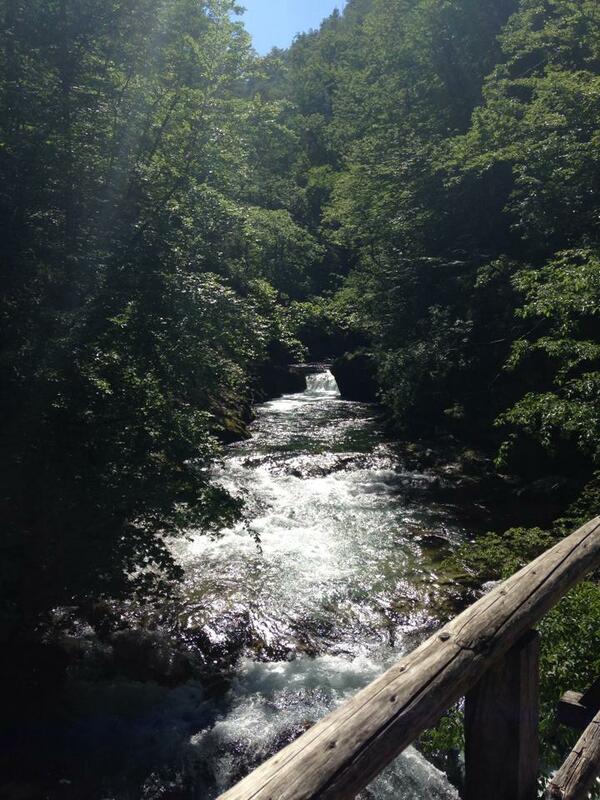 What sets Vintgar apart from other hiking trails, other than its amazing beauty, is the winding wooden walkway that threads the trail through the narrow gorge, right next to the water. At first I thought the hike would be a small thing, a quick ‘Oh look! 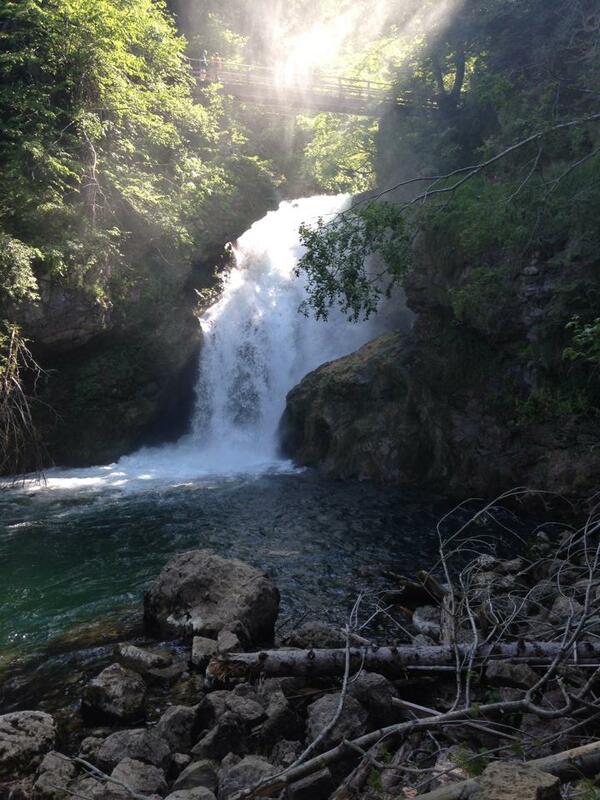 A pretty waterfall!’ a kind of hike. But Vintgar, like most of Slovenia, takes you by surprise. We bought our tickets at the alpine outpost near the trail-head (where you can also purchase postcards of naked ladies lounging by the falls, just in case you were wondering) and started on the hike. It wasn’t a difficult hike by any means but it was very peaceful and luxurious. The gorge towers on either side of the rushing stream that tumbles over rapids. Finally we reached the puzzle-worthy site on the hike, the falls. At first we passed a man-made concrete spillway and were a little worried that the guidebooks might have been pulling our leg about the falls, but around the next bend we saw the falls we were looking for. The afternoon sunlight was filtering through the mist and everything looked kind of magical. At the end of the road we passed to ticket outpost to catch the travelers coming from Podhom. And then we got confused. Both our guide from the hostel and our Jedi Master Rick Steves mentioned a separate trail that could take us back to Bled by a different route and included some lovely views. 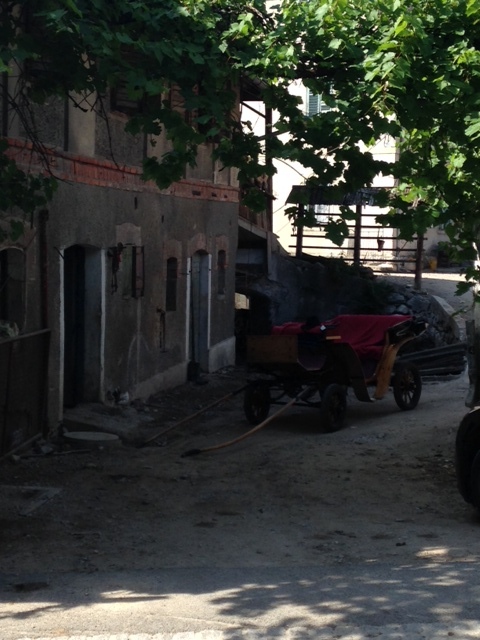 But, once we reached the dirt road on the back side of the gorge it was very clear that we were going toward Podhom. We looked back toward the gorge and only saw rising cliffs that we weren’t sure how we were supposed to climb. I guess the Vintgar ‘gorge’ is called a gorge for a reason. We looked around for the trail a little while longer but decided it wouldn’t be such a crime to have to walk back through the gorge. We nodded to the man at the ticket booth (I guess he remembered seeing two dorky travelers pass by his booth a few times looking very lost) and headed back through the gorge. Out the other side and through the town of Vintgar we stopped at the bus stop only to realize we had missed the last bus back to Bled. Luckily we could see Bled castle from the bus stop. The road was all down hill winding through wheat fields. 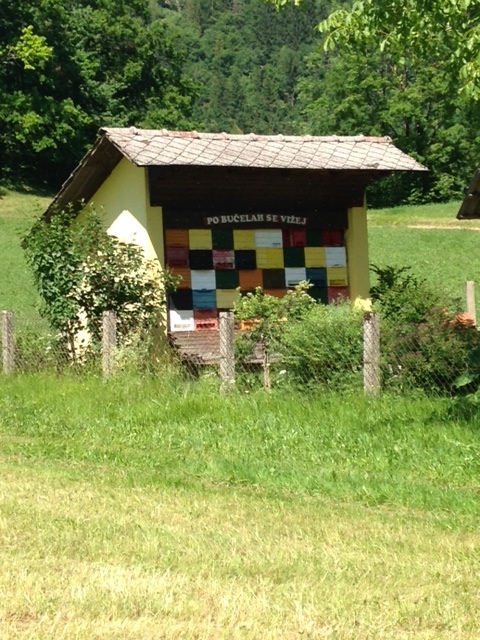 We passed a traditional hay rack that, although now not used by locals, are protected as pieces of national heritage and a beehive, another icon of Slovenian life. 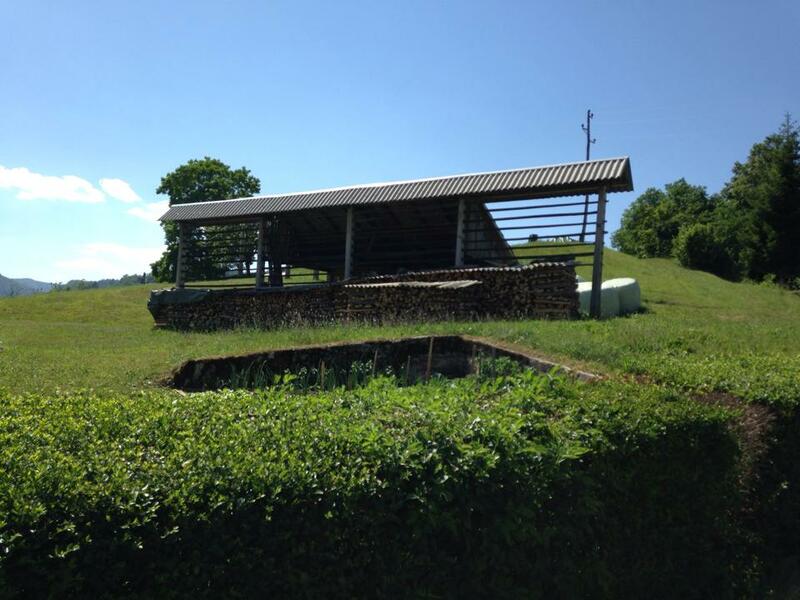 The Slovenian hay rack– the Slovenian equivalent of the California live oak. I wonder if they also get annoyed that they can’t take them down. Beehive– the covers of the boxes are sometimes intricately painted. Beehive box covers are now sold as souvenirs. We also had the pleasure of seeing Bled approach in the distance with the mighty castle towering over the church steeples and buildings in the town below. From this angle we couldn’t see the massive modern hotels and the whole scene felt very medieval-ly, which I of course loved! Back in Bled, our feet were sore and we were starving. We took quick showers while the rest of the hostel crowd was still at the lake and decided on dinner at the traditional Slovenian restaurant across the street from the Hostel. Unlike Mo, I unfortunately don’t keep copious notes of what I ate but whatever it was I remember that it was delicious. I believe we ate a tuna salad plate with fresh greens and a chicken risotto with fresh asparagus. All the vegetables tasted like they had been picked from someone’s garden that morning, which they probably had. I was very impressed by our waiter who spoke English, Slovenian, and German fluently as she waited on various patrons. That evening we hunted up a local bar, which had license plates from around the world on every square inch of the walls and ceiling. Mo and I nursed a pint of beer and tried to guess which country each one had come from. Some were easy, some were definitely not. The bar had a small TV playing Ned Kelly with Orlando Bloom with Slovenian subtitles. Talk about a culture mash-up! We tried to guess what was happening and made up what each of the characters were saying. Then it was back to the hostel and bed for our train to Ljubljana the next day. The adorable house right up the street from our hostel. There were chickens! 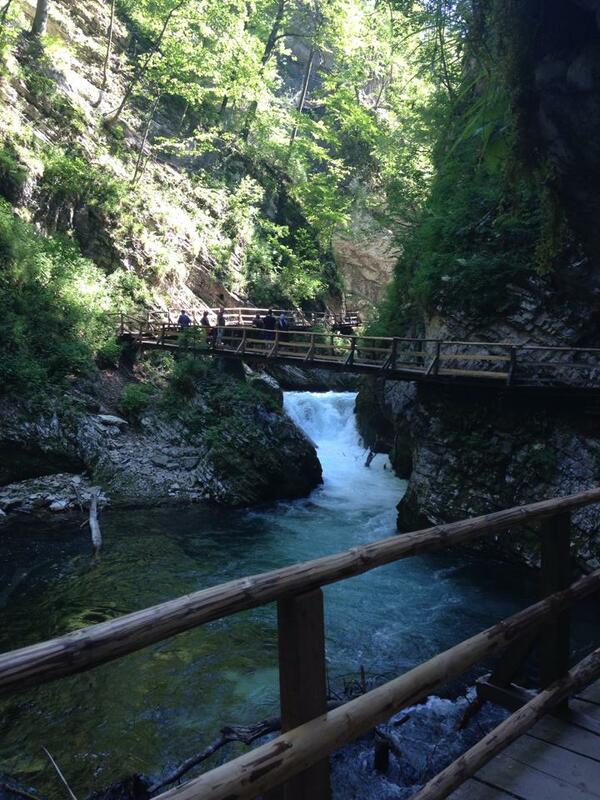 Posted in Places I Go, Weekly Awesome.Tagged adventures, cheap, europe, hiking, journeys, Slovenia, travel, vintgar gorge.